Here’s where you might spot some Quilt Theory goodness if you’ll be there too! (For those of you like me who can’t make it, you can follow everything on Instagram @quilt.theory and there will be a recap on the Quilt Theory blog when everyone is home and settled). First off, one of the amazing Quilt Theory designers and my good friend, Stephanie Palmer will be participating in a schoolhouse session with Christa Watson and Leah Day on book publishing at Quilt Market. If you have any interest in writing a book or just want to hear some great folks speak, definitely check them out on Friday at 4:55pm… these ladies know their stuff! Scrappy Geese Quilt, the back of our postcard, and Michelle, so you know who you’re looking for at Market! Michelle Bartholomew will be joining in the fun on Saturday & Sunday, walking around the convention center, taking photos and chatting up whomever she can! She is bringing some exclusive quilty postcards to hand out too, so if you are there, be sure to hunt her down, say hi, and take a few postcards to mail to your friends back home (pst… like me!!)! If you’ve been excited to see all of the quilts in person, the wait is over! Three of the quilts (Tiled Parquet, Ocean Path–that’s mine!, and Strip It Down) will be in the Checker Distributor’s area along with all of our patterns. Scrappy Geese (shown in the top photo), will be in the Michael Miller Fabrics area. Stephanie on the left, amazing Quilter’s Planner 2017 in the middle, and Yvonne on the right–look for these beauties in Houston, too! Additionally, Stephanie will have a booth at Quilt Festival for the Quilter’s Planner. Yvonne Fuchs from Quilting Jetgirl, another one of our wonderful designers, will be joining her in her booth and will have Quilt Theory patterns available for sale. They’ll also have three of the quilts on display (Jelly Lanterns, Cross Cabins, & Highland Tile). Have a great time if you are going to Houston, and be sure to say hi to Michelle, Stephanie, and Yvonne for me! Quilter’s Planner 2016 Sew-Along Kick-Off! I did it again. I said yes. I couldn’t help it; it was for a friend! Over the past few weeks, I’ve been helping my good friend Stephanie (the mastermind behind the Quilter’s Planner and the one and only Late Night Quilter) with the Instagram feed for the Quilter’s Planner. She’s up to her eyeballs in getting the amazing 2017 Quilter’s Planner printed, proofed, boxed, and shipped to your doorsteps, and so I offered to help her spread the word via my favorite social media application–Instagram. Extra points to you if you’ve recognized my style over at @thequiltersplanner Instagram feed! Isn’t it gorgeous? The 2017 planner incorporates so many new features, like laminated cover and tabs, even more patterns, and beautiful quilt photography by yours truly. Order yours now! Here’s the information and schedule! We are so excited to announce the kick-off of the very first Quilter’s Planner Instagram Sew-Along, taking place over on the Quilter’s Planner Instagram feed! While we all eagerly await the arrival of our 2017 Planners, let’s sew up a pattern from the 2016 Quilter’s Planner! Sew along with us as we make the Scrappy Picnic Plaid quilt by Lee Heinrich of Freshly Pieced, one of the fabulous patterns included right in your 2016 Quilter’s Planner. Don’t have the 2016 planner? Don’t worry—you can purchase the pattern right from Lee’s shop HERE and still sew along with us. 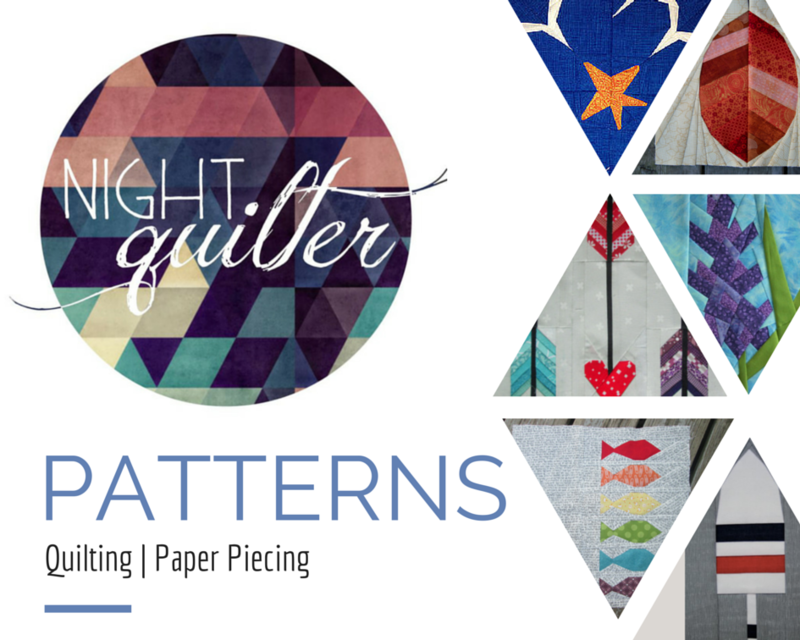 There will be great prizes along the way, generously sponsored by Handiquilter, Aurifil Thread, Threadcutterz, The Quilter’s Planner, and Stephanie herself at Late Night Quilter! There will be a BIG grand prize at the end (pst… new sewing machine plus more! ), eligible for all of you who share a photo of your completely finished Scrappy Picnic Plaid quilt! To join in this Sew-Along you do need a public Instagram account. This pattern is super versatile and perfect for using up scraps! Make as a holiday gift, a scrap buster, or just a fun project with your quilting friends. The Sew-Along will run now through the middle of December, giving a little extra time for the piecing and quilting steps to allow for family time around the holidays. *Note: For every photo you post on your Instagram account tagging @thequiltersplanner and #QP2016SewAlong, you will be entered into the running for the giveaways along the way! Choose your fabrics. Dig through your scraps, visit your local quilt shop, or swap with a friend. No matter your methods, gather your fabrics and show us what you’ll be sewing with! Scrappy or solids? Holiday prints or rainbow fun? Post a photo of your fabric choices on Instagram tagging #QP2016SewAlong ! Cutting. Post photos on Instagram showing your cutting progress, tagged with #QP2016SewAlong. Sewing together the blocks and quilt top. You’ll have 2 weeks to sew your blocks and piece your quilt top! We will be sharing progress and encouragement on @thequiltersplanner Instagram feed, and look forward to sewing along with you! Again, post photos on Instagram showing your piecing progress, tagged with #QP2016SewAlong to enter the giveaways. Quilting and finishing. You’ll have 2 weeks to quilt and finish your Scrappy Picnic Plaid quilt, and we will be cheering you on! Final Link Up. You will have one extra week to finish up any final touches needed to complete your quilt and get the perfect photo of your completely finished and quilted Scrappy Picnic Plaid quilt on Instagram, tagging #QP2016SewAlongFINISH to be entered to win the Grand Prize! Winner chosen from finished projects tagged #QP2016SewAlongFINISH! The giveaways are generously sponsored by Handiquilter, Aurifil Thread, Threadcutterz, The Quilter’s Planner, and Stephanie at Late Night Quilter! More detailed information about what EXACTLY you’ll be winning will be shared soon, but trust us—they’re gonna be great prize packages!! For now, go ahead and grab your 2016 Quilter’s Planner and flip to the pattern (or buy the pattern HERE), reserve a Project Planner Page in your Quilter’s Planner for the Scrappy Picnic Plaid Sew-Along, and repost our graphic on Instagram announcing that you’ll be joining the fun! Please be sure to tag @thequiltersplanner and #QP2016SewAlong in every photo so that you can be entered into the running for the great giveaways along the way! We are excited to sew along with you! Have any questions about the sew-along? Email kitty@quiltersplanner.com and I’ll do my best to answer them promptly! Please keep in mind that we are full time mamas (with too many kids to count), so patience and kindness are appreciated! We are SO looking forward to sewing along and sharing inspiration with you! It’s finally time to share one of the big “secret sewing” projects I’ve been working on behind the scenes for the past few months! Those of you who are also on social media have most likely seen the announcement that I have teamed up with six (6) other pattern designers to launch a new company called Quilt Theory. Today is my day to introduce you to my pattern called Ocean Path, its inspiration and creation, and tell you a bit more about Quilt Theory. You also will have a chance to win a copy of my pattern, Quilt Theory coloring pages, and all of my Art Gallery Pure Elements scraps (enough to get you amply started on your very own Ocean Path Quilt) and Aurifil thread. First, I’d like to introduce you to Ocean Path, my contribution to the debut Quilt Theory pattern line. Our underlying theme for this first collection of patterns was “Where can your quilt take you?” since the designers that comprise Quilt Theory live all across the country. Living in midcoast Maine, an ocean path felt like the perfect inspiration for my quilt. I wanted to embrace the simple beauty of nature while providing a pattern that could be adapted to fit any color scheme, style, or decor. I should note here that the stunning photos included in this post were taken by Michelle Bartholomew all the way across the country in Washington state. Michelle is the mastermind behind Quilt Theory, a talented quilter and photographer, and I’m so grateful to be working with her! There’s something about the simple beauty of the ocean–the clean lines, soothingly subtle color play, and oh so much space to breathe that makes my heart happy–-and I aimed to captured it all in this simple yet striking pattern. I would like to think that you can take a stroll along the coast through the making of the Ocean Path quilt. Using simple construction from easily cut triangles and sashing, this quilt comes together in a breeze. Generous negative space provides room for intricate free motion quilting, or you could finish it with simple modern straight line quilting. Many thanks to Art Gallery Fabrics for providing the beautifully soft Pure Elements fabric for this quilt. I used Tile Blue PE-418, Emerald PE-417, Ocean Waves PE-442, Warm Wave PE-464, and Mirage Blue PE-424 for the feature triangles. The background and sashing are Snow PE-433. The backing is Seawater NE-123 from Skopelos by Katarina Roccella, which is the absolute perfect fabric to back this design! I quilted Ocean Path with echoing, organic triangles within each colored portion using 50wt Aurifil variegated 4654-Seamist. I quilted the bulk of the background with organic horizontal wavy lines with 50wt 2021-Natural White using the walking foot on my Bernina 560, and went a little wild and free motion quilted pebbles into all of the sashings between the triangles and drifting out into the wavy lines. It was one of those times that once I had the vision in my head, there was no turning back. I’m excited to report that it turned out pretty much the way I hoped! I did all of my piecing with 50wt Aurifil 2021-Natural White and 2600-Dove. Many thanks to Aurifil for providing the thread! I think Ocean Path would look equally striking in many other color combinations–from fiery reds and oranges on a dark background, to the soothing calm of cool colors on a light background. I can’t wait to see your version! Let me tell you a bit more about the designers behind Quilt Theory. 2016 collection of Quilt Theory patterns. In February 2016, a group of quilters connected to cultivate relationships with others running businesses in the quilting industry. A tight-knit group was quickly woven together as we shared successes, answered questions, and supported one another. What started as a way to collect real-time insight and expertise quickly evolved into an opportunity to collaborate. Our goal at Quilt Theory is to create simple and modern quilt patterns, and we challenged ourselves to design a line of patterns printed on small cards. As a group, we have become a strong team as we worked through pattern writing, testing, editing, and quilting. Quilt Theory designers have been featured in 20+ major quilting publications and international quilt exhibits. Combined, we have 47 years of quilting experience, and we are excited to share our debut collection for Fall 2016. Pattern cards will be coming soon to a local quilt shop near you! If you are a quilt shop and want to carry our patterns, set up a wholesale account here, or order through Checker Distributors. To celebrate the launch of Quilt Theory, I am giving away a copy of my pattern, Ocean Path (printed or PDF, your choice!) along with a PDF of all of the Quilt Theory Coloring Pages. I’m also including all of the fabric leftover from the making of my quilt, which contains enough fabric to get you amply started on your Ocean Path quilt, plus the rest of my large spool of color coordinating 50wt variegated Aurifil thread in 4654-Seamist. To enter the giveaway today, tell me what color way you would use to create Ocean Path. Leave a comment and make sure I’m able to get ahold of you if you win. For an additional entry, leave another comment telling me how you follow Night Quilter (email list, instagram, facebook, twitter, blog follower, etc.) Follow Quilt Theory (facebook, twitter, Instagram, etc.) and tell me how in a third comment for a third entry. This giveaway is open to US and international participants. The giveaway will be open until Sunday, October 16th, at midnight eastern time when I’ll select the winner randomly with random.org. Giveaway is open to participants 18 years or older. *If you buy my pattern and then you win it, I’ll refund you or let you pick out another free Quilt Theory pattern! This giveaway is now closed! A winner will be announced shortly! Wednesday 10/12- Kitty @Night Quilter <—-You are here! I’m linking up with Crazy Mom Quilts’ Finish it up Friday! Hi! Remember me? I’m currently stuck down the deadline rabbit hole, but am very much looking forward to returning here. I am nearing the finish line for a couple more projects, and then I will have MUCH more time for slow, leisurely stitching and lots of sharing my projects and progress here. The funny thing about the past few months, which have seemed filled to the brim with exciting, albiet deadlined projects, is that ALL of the projects were taken on in the span of one particularly ambitious-feeling week back in March or April. It was right when I was finishing the final touches on my first commissioned quilt, Kittens at Play, and I was feeling on top of the world, having knocked out a few big deadline projects. Within the span of a week, quite a few project opportunities presented themselves to me, and in my feeling of boundless ambition, I said yes. Then I said yes again. Then I said yes a couple more times. Do I regret it? Nah. There’s no sense in that, and the projects have been fun and exciting. But I certainly will learn from it, and by sharing my story here perhaps you can, too. The lesson? Know your limits. Leanne from Devoted Quilter emailed me a few weeks back asking if I would be willing to participate in a blog post she was writing about staying organized. Last week, she posted her compilation post, filled with tips from some of her favorite quilters on how to stay organized with quilting. *Spoiler alert* My tip for her was to know your limits. When every project is a priority with a quickly approaching deadline, it’s difficult to make a prioritized list and keep yourself organized. On normal weeks, the prioritized list I make in my Quilter’s Planner each week is my saving grace. You can head over to her blog to read more great tips for staying organized, and I look forward to joining you soon! I couldn’t write a post without ANY photos, so here are a few quick photos I took along the walk to pick up my daughter from school today. Autumn is officially here in midcoast Maine! The birch leaves are *just* beginning to turn. Queen Anne’s Lace is fully seeded and ready for winter. The maple trees are really putting on a fiery show! How do you manage to stay within your limits even when presented with fun and exciting opportunities!? Clearly, I need some pointers!